Please scroll down to view styles and prices. Electronics don't come in just 3 or 4 sizes so why should Media Consoles? With ours you get to pick the width, the depth, and even the height! You can also tell us how many doors and drawers you want. 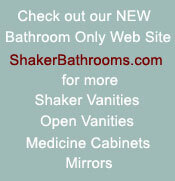 Do you want shaker flat panel doors or pocket doors; or even glass panel doors. Maybe you want open shelves without doors. Configurations are nearly endless. And you even have your choice of hardware!! Our cherry consoles are finished with a hand rubbed natural oil finish. 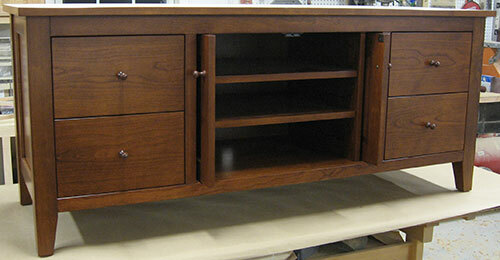 Our hard maple media consoles are finished only with a clear finish. 56 Milk paint colors or 3,645 Benjamin Moore paint colors. 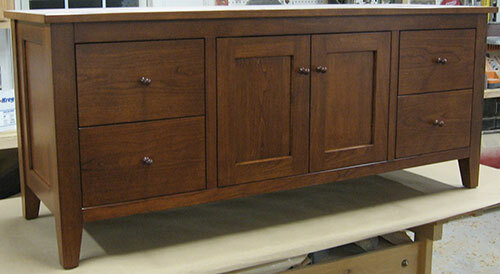 Our red oak media consoles come in a traditional Golden Pecan stain. Our white oak media consoles come in 9 beautiful stains. The solid cherry media console pictured above and below is 60" wide, 20" deep, and 25" high, with four dovetailed drawers, 2 pocket doors, and 2 adjustable shelves. Although we generally do not stain our cherry entertainment pieces, this particular one was ordered with a custom stain and optional heavier legs. Our media consoles are strong enough to hold the heaviest of TVs. Standard heights range from 22" to 27" and depths range from 15" to 22" but if you need a different height and/or a different depth -- No problem and NO charge! Just let us know what you need. The prices below are only samples. We build everything to order so we can build your media console the exact size and with the exact features you want. A 50% deposit is due at time of order with the balance due when your item is ready to ship. Some assembly required unless you make arrangements to pick it up. - where you live (you may be able to get your media console locally!) Here's Why! And be sure to include any questions you have. We will email you back a quote, usually within 24 to 48 hours! Or if you prefer, call us at 603-860-9377 and ask any questions you have at the same time that you give us your requirements. No one offers more finish choices for furniture than we do. Our cherry pieces are finished with a hand rubbed natural oil finish and our hard maple pieces are finished only with a clear satin finish. Our white oak pieces come in the 9 beautiful General Finishes stains shown below. Our painted TV stands are built from Poplar and are finished in your choice of 56 Milk paint colors (shown below) or in any of 3,645 Benjamin Moore paint colors. If needed, click here to visit the MyPerfectColor web site to help you pick out that perfect Benjamin Moore color you are looking for. If you are looking for that authentic aged look then genuine Milk paint is your choice. Look at the colors below or you can see a full page Milk Paint color chart by clicking here. We only use Genuine Old-Fashioned Milk Paint: Click here to visit the Old-Fashioned Milk Paint company web site. If choosing Milk Paint you may also get you piece distressed or not distressed.